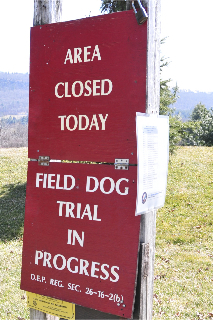 Nod Brook Wildlife Management Area is regularly used by kennel clubs to conduct field trials and hunt tests. These activities usually start in mid-spring and run until late fall. THE ENTIRE NOD BROOK AREA IS CLOSED TO THE GENERAL PUBLIC ON THESE SCHEDULED DATES. Please visit DEP Field Trials schedule.